Wide application available in work materials, from general steel to non-ferrous and resin. Application Material: Carbon Steels, Low Alloy Steels, Tool Steels, Alloy Steels, Prehardened Steels, Mold Steels and Hardened Steels. Expata Business Company is a professional supplier and wholesaler of various types of solid carbide cutting tools in Taiwan. We specialize in selling many kind of high speed and high hardness of solid carbide cutting tools, precision end mills(such as 2or 4 flutes ball,corner radius,aluminum end mills),drill bits(such as DIN338 or DIN1897) for CNC machinery processing and other related cutting systems. Expata delivers superior performance and reliability. 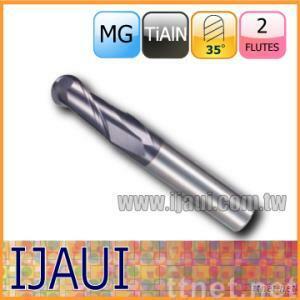 All of our cutting tools are manufactured by Swiss 5-axis CNC grinding machine and made of German carbide rods. More versatile tools can support the 「complete machining」 trend on CNC mill-turn centers.